Over 55 vegan friendly places to choose from! Keep it simple and search Happy Cow! We used to manage an eating guide however Happy Cow has become so effectively awesome and up-to-date, we recommend you use their directory to find your way to delicious vegan food. Look for the “V” symbol! 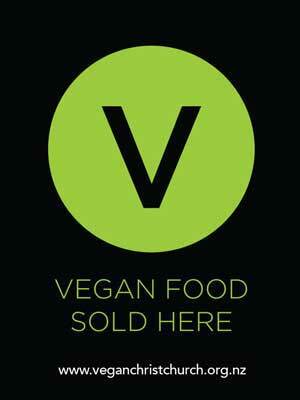 When you’re out in search of vegan food look for our ‘V STICKERS‘ that should be displayed inside store windows or at the display counter or menu. This sticker confirms they are providing vegan food which is awesome. Got a favourite in Christchurch you wanna share?